* Emergi-Lite - 12-631, 12JSM. * Technacell - 80018, M18, M18018, M19. * ADI - EDRWWMPump, EDS, EPP, ERS, ICL1. * Silent Knight - 621, 622, EP1240, EP1245, EP124526, N7HR, S121, S122. * Innovonics - RSM18, SAX. * NAPCO Alarms - MA1016E, C2020, MA1000E4LB, MA1000E4LB PAK, MA1008E, MA1008LKDL, MA1016LKDL. * Digital Security - 1000010118, 1000010161. * Acme - EZXRWWWEP, BEP, BHR, EDC104, EIC1, EP645, EZXWEP, M19017, TC645. * APC - APC BF 280VA BF280C, Back-UPS office 250 BF250, Back-UPS office 280 BF280, Back-UPS OFFICE 350VA BF350, BACK-UPS OFFICE USB 350VA BF350U, BACK-UPS 350 ES350VA USB SUPPORT, BACK-UPS 500 ES 500 VA USB SUPPORT, Back-UPS ES 350VA BE350, BACK-UPS ES 500VA BE500. * SL Waber - POWERHOUSE 250. * GS / Portalac - PE12V5. * Exide - 1000K, POWERWARE 1000K. * National Power - GT024P6. 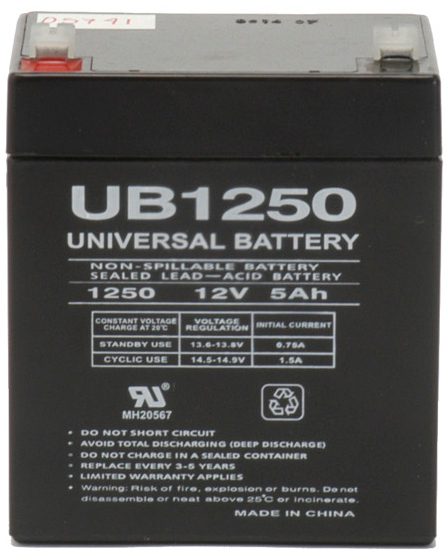 * BB Battery - BP5-12. * MK / East Penn - ES5-12.